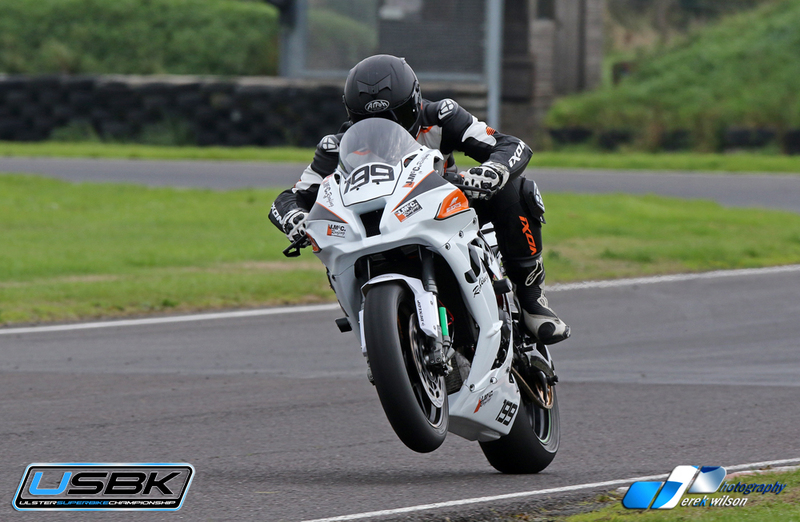 One of the rising stars in this years USBK Superbike championship, is 33 year old Kilkeel bricklayer, Barry Graham. The former moto crosser had his first ride on a superbike exactly a year ago at the Sunflower Trophy event! In a rather strange array of events, it was through his friend, and now team mate/rival, Ryan Gibson, that got the Bricky into superbikes!! “He sold my car and bought me a Superbike! “Laughed Barry as he explained how it all started! !, “ And to be honest, Ive not looked back since! Despite carrying injuries from moto cross, Baz started the 2018 season in the USBK Superbike Cup class, but after six Superbike Cup races, in which he won five, he decided to upgrade himself to the PRO Class, as in his words, “ I wanted to push myself, try and improve my riding by competing with the faster guys”. Since then, The Kilkeel rider has impressed, by finishing in the top ten on a regular basis, in fact, at St Angeleo, Barry had the satisfaction of leading his first USBK Superbike race, when he held the front runners at bay for over a lap! and as we head into the final two races at the Sunflower, he is currently in 8th position! Graham, is part of the JMcC Roofing team, which will also have Ryan Gibson and guest rider for the Sunflower, Carl Philips in action. Whilst Barry concentrates on the racing, a Big Thanks must go to his mechanic Robert Chambers, who keeps him on the narrow and straight on race days!, and also to Liz Gibson, for keeping the team from going hungry at race meetings!